As we are moving next month, we've not really brought to much for our baby yet. our new place we will start buying more bits and bobs for our little one. We have however got a few bits which I wanted to share with you. First of all white 0-3 months pack of 3 sleep suits from Asda you may have read my review here. They arrived when hubby was at work and I couldn't wait to show him them, which of course turned him to goo. 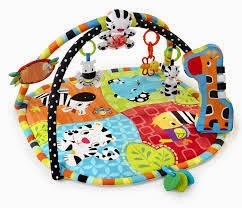 Then we have the Bright Starts Safari Gym which I also was sent from Asda. It's bright and colorful and am sure our little one is going to love it! I won an unwanted prize last year so I swapped with another comper. I love Tatty Teddy so couldn't resist. so I just had to nab it. The set has a room, bath and head temperature thermometer. I also am awaiting some muslin cloths which I also brought with my voucher to arrive.